This is it. With the increase in E100 Whine and UP cry threads popping up lately- I have decided to completely remodel my Tutorial/help thread on this tank. It will include tips, tactics, diagrams, statistics, actual historical information, and finally once I have them uploaded, I will include a sample of tutorial videos showing tactics in play. Now I know I am not the best ranked player, but despite my owning all of the T10 tanks but the Maus and AMX 50B, and despite my better results in other T10 tanks, this remains my favourite to date. 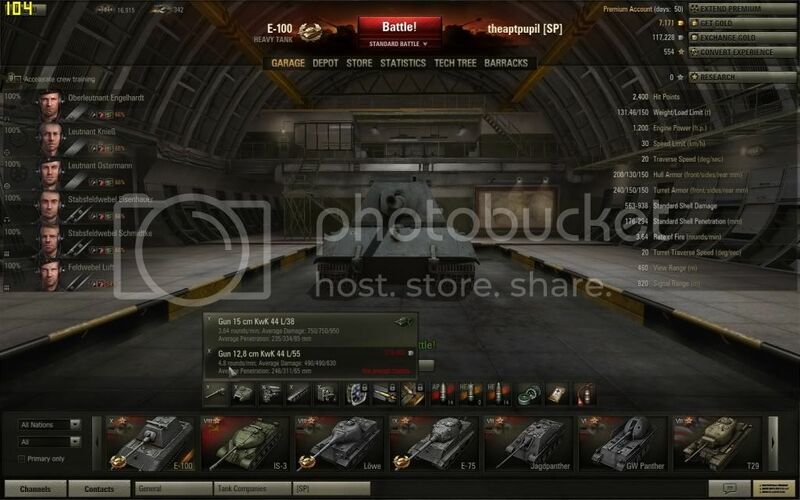 Maybe its sentimentality, but I WILL NOT let my first Tier X tank gather rust in my garage. The basic design was ordered by the Waffenamt as a parallel development to the Porsche Maus in June 1943. It was the heaviest of the Entwicklung (E) series of vehicles, meant to standardize as many components as possible. In November 1942, Krupp suggested a design weighing 155 tons, compared to the 188 tons of the Maus - but still using the Maus turret. In December 1942, Krupp suggested a design weighing 130 tons which used many of the same components as the Tiger with Maus turret — referred to as the Tiger-Maus. Weight savings were to be from thinner armour, and narrowing and shortening the vehicle. Despite the vehicles alleged advantages to the Maus, which can be seen by comparing the Maus technical data table to that of the E-100, Hitler decided to go ahead with the Maus on January, 1943. There is no apparent explanation to this, but possibly, Hitler did not like that Krupp designed a vehicle by themselves when another company already had the contract. Although Hitler favored the Maus, Oberbaurat Kniepkamp obtained permission from Waffenprüfung 6 to go ahead with the Tiger-Maus, renamed to E-100, as a part of the Entwicklung series. There were some modifications to the original design, such as mounting a double external coil spring suspension. The Maus turret was still to be used. This is a game changer tank, and Krupp himself believed this when he named the whole series of standardpanzer tanks the Entwicklung series, which can be translated into either Evolution or Development. This is German tanking evolved. and here is the statistics of the various types of ammunition for the 150mm KwK43 L/38. After the AP and HE nerf, the 150mm took one hell of a hit in combat effectiveness. Now you need to concentrate on your aim, observe where your shell lands and make a mental note of penetration. Turning on the in-game markers will help you understand the kind of damage this tank deals. In most penetrating shots, I am dealing over 700 damage, and most of the time less than 900 with AP. with HE, I am almost guaranteed to do some kind of crew or module damage, but only 200-400 damage since I can not longer penetrate as much. without going into any mathematics, the simplest way to angle your armour is to put the front corner that reveals as little of your lower glacis as possible, and to show a little side if you have to. Tier X guns will have no troubles penetrating your lower glacis at almost any effective angle, but most shots to the seam tend to scrape along the upper hull, and the side skirts work just like spaced armour, so try being a little flirtatious in battle. Another strategy is something that I see a lot of E100's attempt, and sometimes it works, sometimes it fails. It is best when your team have either died off or abandoned you, and its something I call "the bully". Using your E100 as an extremely offensive tank. (no- that doesnt mean you can go out and drop a flurry of slang language about the enemies mother or younger sister's sexual habits). The KwK44 L/38 can deal out MASSES of damage, much like the T30, but when you use your armour angling, you can potentially hunker down and take out 3 or more lower tier tanks that are trying to pound you into the ground. The essence of this strategy involves you picking a time and weak spot, shooting it, watching the 650-900 damage dish out, then effectively watch all of your enemies back off. Do not just let them sit there. you need to keep up the pressure. You are a freaking heavy tank with decent acceleration. use this while your reloading for extra damage. I can ram an IS-3 for over 200 Hp at a 17-22 Kph ram. with the spall liner equipped, you will NOT take any damage for ramming lower tier tanks, but they will. The aggression will affect the other player psychologically and youll see him doing everything but turning tail and running to try and get one in on you. By ramming and face hugging your opponent, you are also doing 2 things: 1) your making it impossible for them to shoot your lower glacis, and too close to get a reliable hit on your turret "face", and 2) hiding your lower glacis from other tanks. Notice how you cant actually see the lower glacis of my tank, but you can clearly see the gun? Use this. 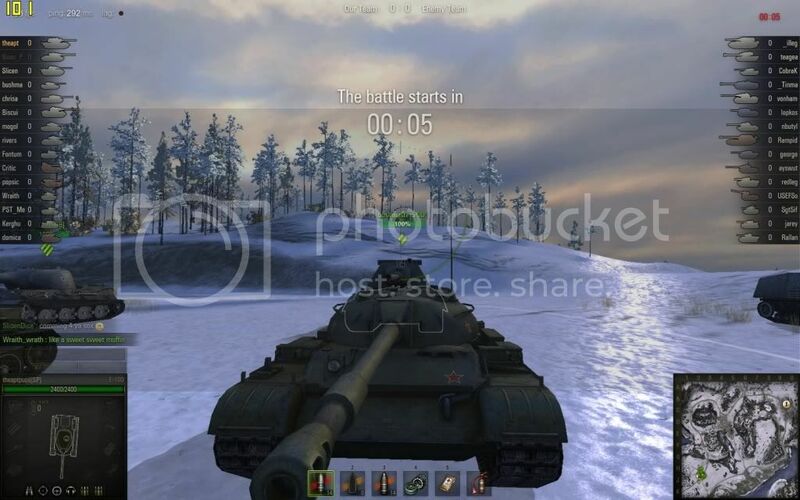 Also in that game that I have used for in- game screenshots, my 2 kills were both the Maus and T95. just a little tidbit of information for you. I didnt screenshot the victory screen though, because aside from achieving daily double, I didnt actually do anythign that I consider outstanding to warrant screenshot. Edited by theaptpupil, May 13 2012 - 21:33. Edited by theaptpupil, May 13 2012 - 09:54.
lol apt you beat me to it. This thread should be pinned. very useful. thank you all guys. I will endeavour to have this finished by tomorrow. Great guide. Plenty of detail. Too bad it's going to be a few months before I go E-100...American and Russian trees are keeping me busy. Still, I'll keep this in mind! Great Thread, glad to see a clear view on the E-100. This thread will be helpful to E-100 Drivers, and to others to understand the role of the E-100. Komarin: I end up in the centre and do nothing. Sand River: from the North spawn it seems to be harder, last night I went south then east, and ground to a halt when all my support was killed. Then my team mates where telling me to advance, blah blah ebay e100 blah blah, and I was like hey arty will just kill me, I am alone now, I can't snipe that far etc. In the end we tried a concerted push, and I died almost the moment I was spotted, their arty got me moving at full speed! 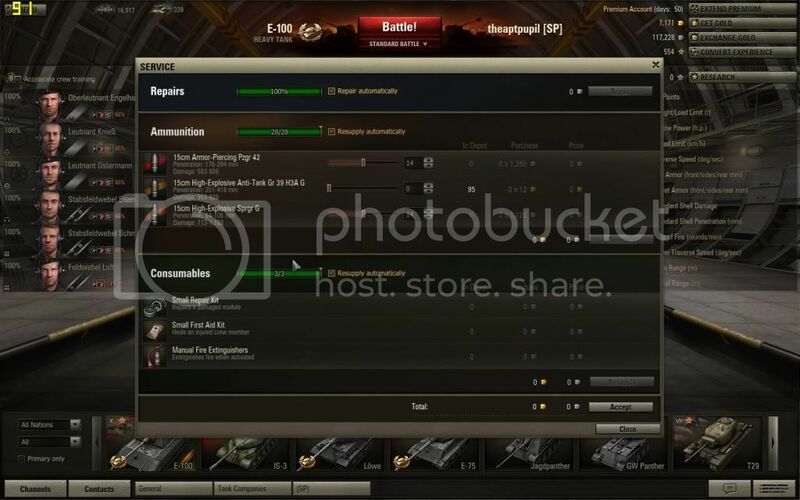 Erlenberg: Which is the best advance flank for the E100? Thanks for you help, I'll watch the vids when I get home. I have failed you master, forgive me. what is a "spiral longer" ? And accuracy issues is RNG dependent... and range dependent. How far would you say the 15cm is dependable to?